In part one of this series, I attempted to simplify what I believe are the central problems in identifying and understanding the patriarchy movement. As everyone who has studied or been touched by this group within the homeschooling world knows, this is a large beast that has many tentacles and my few short paragraphs cannot do it justice! Combined with my patriarchy/patriocentricity podcasts, I hope to whet your appetite just enough for you to dig further! In part two, my goal is to present a simplified version of the history of the patriarchy movement within the modern homeschooling culture, in part, to demonstrate that the teachings advanced in the patriarchy movement were not part of its founding. Again, it is very condensed and I encourage you to research even further! During the late 1970s when Clay and I were formulating a plan for our future after nearly four years of military life, the topic of homeschooling surfaced in our discussions for the first time. Amazingly, we had never heard of anyone who actually taught their children at home and didn’t know if it was legal or not but it seemed like something we might want to consider. Like many people who grew up in the 60s and came of age in the 70s, we already had an anti-establishment mentality and were not inclined to embrace something just because it was “normal.” Though initially we didn’t teach our children at home, we soon realized that we really wanted to be with them and, as we grew spiritually, also knew this desire was God-ordained for our family. Though many other homeschooling parents of the 80s did begin homeschooling with the goal of discipleship of their children in mind, I think it is too easy to consider that era as the beginning of modern home education. John Holt, an elementary school teacher, was one of the earliest promoters of education at home. His first two books, How Children Fail, published in 1964, and How Children Learn, published in 1967, challenged the very nature of formal education itself. He believed that “children who were provided with a rich and stimulating learning environment would learn what they are ready to learn, when they are ready to learn it”. Beginning in 1977, Holt’s Growing Without Learning magazine was the first homeschooling newsletter to ever be published in the US and in 1981, this outspoken advocate of homeschooling wrote Teach Your Own, a standard for learning outside the classroom. It is important to note that until the Focus on the Family radio programs featuring homeschooling and the Moores, Christian evangelicals, for the most part, placed their children in public schools and Christian fundamentalists continued the tradition of hosting small Christians schools in their church basements, mainly for their members. Though there were a few instances of children being educated at home, some using distance learning services like Calvert, homeschooling was practiced mainly by parents who were students of Holt or missionaries who ordered materials from Christian school suppliers such as Bob Jones Press or Christian Liberty Academy. It should be noted that at this time, no one was marketing a patriarchy agenda. Then in 1984, Bill Gothard made the decision to expand his Basic Life Principles seminar into a curriculum for K through 12th graders based on the Sermon on the Mount. Among other teachings, Gothard’s chain of command view of authority, a presentation he taught as the only biblical approach, was presented throughout. A couple years later, he introduced the Advanced Seminar and along with it a plethora of ideas and lifestyle choices whose applications were based on his original seminar. These served as a stepping off point for others who took his basic teachings and expanded them, especially when it came to a structure of hierarchy in the home. (It can be argued that both Phillips and Gothard were originally influenced by Rushdooney.) Jonathan Lindvall, a pastor from California and one of those whose teachings reflected these views, practiced and taught what he called “betrothal,” “an irrevocable and publicly announced commitment to marriage, only terminated for infidelity, during which the cultivation of a romantic relationship is permitted. Betrothal is instigated by the young man and woman with the full approval of parents. No physical contact occurs until after the wedding.” The role of the father of the bride or both fathers of the bride and groom became central to homeschooling family life in choosing life partners, thus patriarchy itself was also central. By 1993, Phil Lancaster, a PCA pastor, also became a well-known patriarchy apologist, publishing a magazine called Patriarchy, which also promoted many of Gothard’s views on men and women. His magazine was shared by homeschooling fathers and was distributed through homeschooling conferences. In 1998, Doug Phillips left Homeschool Legal Defense to move to Texas and begin Vision Forum Ministries. Originally, Vision Forum provided a catalog of fun toys and books based on promoting the value of US history and civics. Though I am unable to document this, as the Vision Forum website has been scrubbed, as I remember it, they really didn’t build up their patriocentric steam until after the Y2K kafuffle left them with a void needing to be filled. We cannot underestimate the affect Y2K had on the patriarchy movement. Prior to this time, within mainstream Christian homeschooling circles, those who followed Bill Gothard or Jonathan Lindvall were considered fringe. (It is important to note that secular homeschoolers or Christians who were not homeschooling for religious reasons were increasingly offended by groups like HSLDA speaking for them with public officials and attempting to make laws to “protect” homeschoolers. This opinion continues today.) Though Lancaster’s magazine was seen at conferences, its content was pretty mainstream, encouraging fathers to be actively involved with their families and to take spiritual leadership in their homes. Then, as Doug Phillips began more and more of his promotion of a patriocentric lifetstyle, others joined him in laying out this agenda. In his book Family Man, Family Leader, published in 2003, Phil Lancaster uses the true biblical concept of Jesus being prophet, priest, and king as a word picture of the roles of fathers in their homes. Although he states that the father is not the mediator between Christ and his family, but rather is a representative, the impression that is created from reading his book, along with the writings of other patriarchs, is that there is a fine line between being a representative and being a mediator. If this is troubling and confusing to someone like myself who questions all these teachings, could it be even more bewildering to those who seek to apply the patriarchy teachings in their own lives? Along with Lancaster, R.C Sproul Jr. and Voddie Baucham began promoting patriocentric views, Baucham also expounding on the prophet priest, and king doctrine and Sproul describing his own wife as calling him “lord.” In the early 2000s, James and Stacy McDonald climbed on the same patriocentric bandwagon, publishing under the title of Patriarch’s Path, originally promoting a Lindvall type of betrothal model where breaking up with a betrothed was considered to be a divorce. Eventually they introduced 160 plus courtship questions for suitors and continued to speak on the courtship model at homeschooling conferences. In 2007, Stacy authored Passionate Housewives Desperate for God, published by Vision Forum, which painted what she and co-author Jennie Chancey called a “fresh vision” for women, making it the handbook for patriarch wives. Along with her book, the Botkins’ So Much More, also a Vision Forum publication, outlined a vision for patriocentric daughters and all of them, along with Kevin Swanson, promoted what became known as the stay-at-home daughters’ movement. It was also during this time that Phillips started the National Center for Family Integrated Churches, providing a place for the doctrines of patriarchy to be advanced even further. Joined by Scott Brown, another advocate of patriocentricity, the NCFIC was soon being promoted at homeschooling conferences and insisting that all homeschooling families were members of a family integrated church was one of the key points in the manifesto being advanced at the 2009 Homeschool Leadership Summit. So how did this happen? How did homeschooling convention planners and support group leaders come to accept the patriocentric agenda and even help advance it through their events? I believe there is one motivating factor: fear. Fear of the world crashing to a halt via technology, aka Y2K. Fear of a feminist agenda taking over our country as demonstrated by the 2008 presidential election when Hillary Clinton nearly won the Democratic nomination. Fear of the increasing homosexual agenda that has made tremendous headway, into even the evangelical church. As a result, half of the Christians, the women,who could be engaged in spiritual battle against those things that really threaten our families, have been devalued at best and immobilized at worst. So what are the ramifications of the patriarchy movement? Where is this going? Is Doug Phillips’ fall from grace the end of it? We have the first two VF catalogs… we just found them again after having a similar thought that it started out just wholesome & fun – not weird. Noelle Wheeler is on cover w/maybe a very young Liberty & a couple other little girls… just seems a //to the American Girl catalog. The boys catalog has a multicultural group of little boys in astronaut costumes on front and some of the much younger Phillips boys modeling costumes inside. Thank you for doing this series. As a homeschooled graduate who was a child during this time it’s good to get a broader picture of where things went wrong. All this was happening around us without our knowledge. The kids in the homeschool movement enjoyed many blessings. My siblings and i loved our homeschool group, we have so many wonderful memories. I want the same blessed childhood for my kids. But those of us who came of age in all of this are feeling a little bit lost, like our cohort is suddenly tainted. It’s sad to see the good things we experienced be devalued because of the recent scandals. Things like the focus on family unity, individualized learning, godliness, and character-driven parenting to name just a few. Of course all of those are possible without homeschooling, and homeschooling is definitely possible without patriarchy, but I don’t know how it’s done in practical terms. It’s so difficult to have everything change just when you thought you had it figured out. It’s really a tragedy that these men took things in a strange direction during the last 15 years or so. It’s a tragedy that the leaders have let us down. It’s like the rug was pulled out from under us and we’ve got to figure out a new direction for our families now that we’re adults. Nothing is wrong with blazing a trail, of course. But the fear of leadership that comes from being burned can be debilitating. My kids are getting close to school age i’d love to homeschool but things are just so confusing now with what has happened. Thank you for making things clearer. Sallie, do you know whatever became of the Rivendell community? I think I knew at one time, but have mostly forgotten. Karen, do you remember? I have an idea, but don’t want to speak out of turn. Did it have something to do with the daughter of one of the leaders running off? Christians, they were typically far from that. to fight future persecution by the government. Sallie, I don’t know if I ever knew the reasons Rivendell dissolved and it sure isn’t hard to figure out! I cannot imagine being in that sort of community with Phil Lancaster, etc! I was pretty amused by the article you posted because we had people exactly like these men in our church. Every single Sunday, for about a year and a half, the subject of Y2K was always discussed at our weekly potluck meals. One man was quite the follower of Gary North and often printed out articles from North’s website to hand out to all the men. His whole family was trained with government grade weapons and they had enough food stored (grains, freezer dried and canned foods) to sustain themselves for a couple years. He tried to get other families in the church to move out to where they lived in the country and one family did, buying a house this man’s wife located for them. (Sadly, it eventually lead to the family’s financial ruin.) My husband was asked to be the man in charge of weapons and paramilitary training because he had been in special forces. He shuddered at the thought of all those paranoid people having access to assault rifles and firmly declined! My husband, working in the electrical power industry, knew the steps that had been taken to preserve the grid and tried to explain this. This man was pretty frustrated with our family and even told my husband, in front of other men in the church, that he was an irresponsible father for not having moved out in the country to prepare, let alone to give false hope about the electrical industry. We all know how that worked out. Dawn, oh Dawn, I believe there are so many moms who are experiencing Phillips’ downfall in the very way you described! And especially when you had such a lovely childhood and upbringing and want the best for your own children! Understanding where the bad teachings came from and choosing to hold all teachings up to the light of Scripture will end up being more of a blessing than you ever imagined. Knowing the false paradigms lurking behind these men is giving you an opportunity to give your children an even better life experience! I do not believe Doug Phillips or Bill Gothard or any of the people who teach these things believe them false and they actually think these things are right and true. But they have forgotten the beauty of the true Gospel message and have ignored how the Lord works in creative and individual and blessed ways in each person and in each family. I still come back to what I believe in my heart to be the example He has given us in Scripture….the one another verses. As we apply these in our own lives and in our homes, because they are the true commands of God’s Word, I believe we will see all those fruits of the Spirit…love, joy, peace, etc. It is really all so easy to see, though not always easy to practice! And something truly amazing happens when we obey these truths…..we start looking at everyone with new eyes, desiring to put them above us, not desiring control or power, even finding those things appalling. We look at husbands and wives and children in new ways and I believe with all my heart that God blesses this beyond anything we could ever imagine! 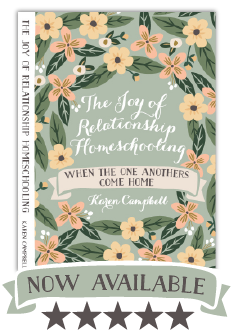 I might chime in too and offer Karen’s new book as an invaluable tool of encouragement and mentoring for homeschooling moms (or potential ones). She gives many wonderful reasons to choose homeschooling, namely to preserve and build the relationships we have with our children, our fellow brothers and sisters in Christ. This book is saturated with wisdom and love; it is so far and above anything else I’ve read about why to homeschool and how to parent, I only wish I’d had it sooner. My conviction to homeschool has been reenergized by this dear woman’s words, and I know her wisdom and experience would help in your situation too. The last two school years have been very difficult for me and I’ve been soooo tempted to give up, especially with all of the drama in the “movement” – her book has been such a bright spot for me, I know it would be for you too. Whew!!! …..is right! Fear is absolutely a Huge factor and I honestly never thought about the Y2-K thing like that but it does make sense. I have a funny story about Y2-K. Some of the strongest Christians and most level headed people I knew were having a meeting about Y2-k after church one night. My husband and our best friends from church were invited. As we sat around the table that night(the women were in one room meeting and the men in another room) my best friend and I just kept looking at each other thinking..”Wow-we had no idea it will get this bad.” We placed an order with our normal co-op order and when I got home that night I called her immediately and we discussed all we heard. These were people we loved and greatly admired. They had shared all they had done to prepare and we were basically realizing(Best friend and I) we really were not prepared at all. I shared with her what extra’s I had ordered from the co-op. She starts hysterically laughing and tells me ” Do you realize you just ordered 500 pounds of wheat. (at the time I made my own bread). I could Not stop laughing. I had to hand the phone over to my husband who by the time figured out what I had done could not stop laughing either. When we both finally calmed down he looked at me and said “Don’t forget to call on Monday and change that order to the normal amount!” I did. It took him a couple of days but he finally told me that the main talk in the guy’s meeting was how to make fuel out of rabbit droppings….Seriously!!! We ended up basically just preparing like we would during hurricane season here. I have always wondered how long it took them to go thru all the supplies they had bought. One friend…Seriously…Had an entire room….Bedroom….filled with toilet paper!!! These really were nice and level headed people! Truly Amazing what “Fear” can do!! We still laugh about it to this day! Now, saying all that…I so easily see how people can get so caught up with fear! I know that God used that to mightily show us to really look to him and ask him. When I read your comment about what you said about letting your neighbors in and feeding them and helping them I was thinking Yes!!!! That is exactly what I recently told someone about not shooting someone over food! They can take it!! May the Lord give us the wisdom and not the fear of man! I haven’t been tempted to give up because of the drama in the movement-but honestly just because I’m older now ..lol..and honestly just more tired! I will not give up!! Thanks for your encouragement always Karen!! I will be ordering your book soon!! I am a homeschool graduate and hopefully a future homeschooling mom. Over the past several years, I have been taking a deeper look at the topics of patriarchy, quiverfull, courtship, modesty and other teachings that I grew up with. I’m trying to untangle this mess to figure out what I actually believe and what I want to teach my children. As part of that, I have been trying to untangle my family “history” and what leaders and ideas influenced my parents. Unfortunately these are not topics I can really discuss with my parents at this time. I keep hearing the name Phil Lancaster pop up. It has sparked vague memories from my childhood that I am not trying to piece together. I remember one time when I was pretty young, my family visited some people by the last name of Lancaster and Phil sounds about right for the man’s name. My parents said that the man was a friend of my dad’s, but I had never met or heard of them before. I remember playing with the family’s children while our parents talked for hours. I also remember going to their church, which was held in some sort of large garage. All of the men served communion to the families and everyone drank out of the same cup. I remember thinking the whole thing was a bit odd, but I was too young to take note of much of what was going on. My best guess is that this visit took place sometime between 1996 and 1998. Can anybody tell me if this sounds like it might have been the Phil Lancaster that others have mentioned. Can anyone tell me where I might be able to find more information about this guy? Where do you see Mary Pride fitting into this history? I remember feeling there was some kind of unknown (to me) philosophy behind some of her positions and opinions, back when we used to get her magazine. We homeschooled from 1991-2011, but always felt somehow not part of any group, secular or Christian, since we didn’t necessarily follow the majority opinions of either. Probably we were most influenced by the Moores. Thanks for your website – I enjoy reading it to get a balanced opinion on some of these current events. Karen and Michelle, Thank you for the kind words! I’m so glad that we can trust God to lead our little family and others like us out of all the confusion, to the truth. It’s a day to day thing, for sure. No trusting in autopilot. Time to be Bereans and search the scriptures for ourselves. It would be so easy to just follow someone else thinking s/he knows The Way. But that is not taking responsibility. Growing up is learning to carefully sift through things and weigh them against the truth of the Bible. So far life has taught my hubby and me that love triumphs over legalistic formulas. That wasn’t an easy lesson to learn! Looking forward to reading your book on relationship homeschooling, and just listening to others and learning more every day. Thank you. Another excellent post, Karen. Being in the PCA myself, I wonder where Phil Lancaster is now. I’m surprised Kevin Swanson hasn’t been taken to task by anyone in the OPC for what he does on his radio show. It’s easy to see how certain men who have no denominational structure over them can escape accountability, but I would have thought those ordained in legitimate denominations would be getting called out by somebody, eventually. If others have been approaching them in private, there is no evidence of it. Of course, after the Peter Leithart heresy trial over the federal vision and its outcome, maybe I shouldn’t be surprised at all. Unfortunately, I don’t think for a minute that the fall of Gothard and Phillips will be the end of neopatriarchy. I wish that were the case, but there are too many other true believers ready and willing to pick up that particular banner and keep carrying on. What I would really like to see is someone with the stature of Michael Farris come out with a more formal statement on patriarchy, what’s wrong with it, and how it has adversely affected the homeschooling movement. I’d like to think that he has been doing more than just covering his or HSLDA’s backside. Those in leadership of the state or regional conventions need something to shake them up. Right now the blogosphere has been doing that job, and to a lesser extent social media. The recent scandals have caused a lot of questions to be asked and a lot of soul searching, and this is a good thing. The big proponents of patriarchy, however (especially the ones whose livelihoods have depended on its propagation) are not going to suddenly drop the whole thing and admit to being wrong. It’s quite an undertaking to reexamine a huge portion of one’s worldview. This is a debate that will continue for a while yet as the Lord brings to His church the discipline that was formerly lacking. Phil Lancaster. I haven’t seen anything written by or about him since the Vision Forum book came out ten years ago. As I recall, he co-authored the Tenets of Biblical Patriarchy along with Doug Phillips and R.C. Sproul Jr. I know he started a small church in the St. Louis area sometime in the 80s or 90s and Mary Pride was part of it for a while. Can’t imagine! Lancaster also helped organize that first Uniting Church and Home conference in the St. Louis area around 2003, along with a man named John Thompson and Doug Phillips. Based on the book by the same title, written by Eric Wallace, who was also part of that event, I don’t believe the original intent was to begin a separate group of churches and to become FICs. Rather, the goal, at least for Eric Wallace, was to address some of the issues that caused problems for homeschooling families within their traditional churches. I believe Phillips and others saw this as a way to network and eventually persuade groups of homeschooling families to separate from traditional churches. It also because a way to indoctrinate these same families into the patriocentric worldview. Bill Gothard always encouraged families to stay in their local churches and serve others rather than to demand their own way. John Thompson, btw, had his own nutty brand of betrothal. I’ll see if Tim Swanson will share his story about that here. Mary Pride was one of the first leaders in the modern homeschooling movement. Her book The Way Home was a powerful rebuttal of the radical feminist agenda and she minced no words as she made an appeal for rejecting all sorts of sacred cows. Mary was outspoken and certainly no model of the perfect patriarch wife and ruffled lots of male feathers. One of my fondest memories of homeschooling in the early days (nearly 30 years ago now) is of a conference in the St. Louis area with Gregg Harris, Michael Farris, and Mary Pride. (As I recall her husband also spoke.) Michael Faeris played his guitar and sang a funny parody of participating in “sword drills” as a kid and the whole thing had sort of a Christian hippy flavor. Yes, dads were encouraged to be involved, but Mary had equal status as a speaker and there was no weird talk of any of the stuff that would be found today. Mary Pride comes the closest to teaching something akin to militant fecundity back then, as she was intense in her passion for having lots of children. However, I don’t recall it having the dominionist edge to it that came along with Scott Brown and Phillips. I do think Mary was marginalized as time went on simply because she is a woman who doesn’t fit their mold. Another person who had a lot of influence in the 90s was Cheryl Lindsey who published Gentle Spirit magazine. I loved that publication and always looked forward to getting it in the mail. Cheryl had a large family (10 children I think) and maintained a homestead in Washington state. Her writings inspired women to ask “What do I have in my hand?” in order to become for content with their surroundings and life situation. I do know, though, that sometimes what she wrote was a bit ethereal for my taste and I gravitated more toward the practical things in her magazine. Her ministry came to a screeching halt when Gregg Harris discovered her in an adulterous relationship with a man she had met online and while she was speaking at a homeschooling conference. It all snowballed from there resulting in Cheryl suing Mary Pride, Gregg Harris, and Sue Welch, who published The Teaching Home magazine and winning hundreds of thousands of dollars. Her win was based on claims that there had been a conspiracy to put Cheryl out of business for financial gain of their own. HSLDA was involved in that in some ways well. And speaking of The Teaching Home, it was a huge publication during the 90s for conservative Christian homeschoolers. Ladycelt, I agree about wondering why these denominations that are all about holding people accountable fail to do so. I personally believe this is one of the problems with ignoring the biblical command to “admonish one another.” That command is to all of us and we shouldn’t have to feel like we have to wait around for some higher up to address problems. Unfortunately, the system itself has made it so we feel we cannot and often if we attempt to follow that command we end up being accused of contumacy. I agree. I am watching the jockeying already beginning,part of what I will discuss in part three. Michelle, thank you for your kind words about the book. Please feel free to turn that into an Amazon review! I am truly hoping the message of one anothering our children will become a standard approach in parenting embraced far and wide!!!! Wow, Lancaster was a busy guy. Thanks for the info. I think families who desired to keep their children with them during the church service were running into real problems with churches where people had sent their kids off to Sunday school for so long, the idea of training them to sit through/participate in the entire service seemed totally alien. Or were too worried about noise. Pressuring parents to utilize the nursery or Sunday school is just as wrong as teaching that family integrated is the ONLY way to do church. Once again, it seems that the ‘normal middle’ is the place to aim for instead of the extremes. If I remember correctly, wasn’t there a falling out between Raymond Moore and both Michael Farris and Gregg Harris in the early 90’s? Wasn’t Moore concerned that Farris and Harris were creating division within the movement and adding faith requirements in order to be part of the movement? Where would that fit in the timeline? Also, I was handed Mary Pride’s book early on in our homeschooling days. Yes, she advocated throwing away all birth control and having as many babies as you can. It was quite a “revolutionary” idea within my little church and homeschooling families. Monique, I handed out her book to some trusted friends, too. I still think much of what she shared was worth considering!!!! Be sure you read all of it. Explains so much. And, yes, there was this conflict between Moore and Farris. In short, Moore thought that HSLDA had served its purpose and any further lawmaking attempts were more harmful than good. It is a great read to see what happened to Moore and it does hall make sense of the marginalization Moore’s teachings have gotten. Unfortunately. These were written mid 90s but Moore claims Gregg Harris began causing problems in the mid 80s. Its all in the documents. Apparently a female needs a covering and authority from cradle to grave, and she is incapable of choosing her own husband. One man actually told his daughter that until he finds her an approved suitor she is married to the Lord and he (her father) is her boyfriend. Yuck! And I won’t even start about the disgusting dating daddy business or the mysterious missing moms. And here’s the other thing that gets me: Randy Wilson is employed by the Family Research Council and used to work for Focus on the Family. I used to think those organizations were on the conservative side of mainstream evangelical. I guess I was wrong. Amen sister! That is what growing up is all about, and as long as we’re on this earth, that growing up process never ends. I am ever so thankful that Christ and His Word is for ALL believers on a personal and intimate level – we don’t need interpreters. I’m just chomping at the bit to write that review! However, I’m only in chapter 4. I have to tell you though, that I am LOVING the book! I thought I would probably really like it, but it has (so far) completely surpassed my expectations. Perhaps it has a lot to do with the timing, as we’ve been struggling lately, but each morning it has been like sitting down with a good friend and getting encouraged, built up again, and pointed back in the right direction. For I started with these ideas in mind, but so quickly my good intentions morphed into something rigid and ugly. Patriarchy has been a part of it for me (thankfully I have a hubby who wouldn’t even dip his toe into the water so it didn’t ever really get legs around here) but a lot of it is my own fear and perfectionism. I believe these are reasons that people go full on into this formula-based way of educating and doing family, as mentioned above, and I’m just so thankful for a place where Christ-loving people can come and discuss. And the book – just a treasure! Second, I wanted to chime in a bit on the history. Karen is right that it wasn’t until the last couple decades that Patriarchy really took off in the homeschool movement, but the philosophical underpinnings always existed. The debate between the Moores on the one hand, and R. J. Rushdoony on the other began pretty much at the outset, in the 1960s. While the Moores looked at homeschooling as a way to avoid the problems of industrial education and focused on the needs of the child, Rushdoony saw an opportunity to build an army to establish his theocracy. I was a bit shocked to find out how far back Rushdoony’s involvement with both HSLDA (he was an “expert” witness for them for many years, pretty much from the outset) and with Doug Phillips (close personal friend of Doug’s dad, Howard, the presidential candidate). So, this element was there all along, but it didn’t really take off until relatively recently. I was homeschooled from 1983 to 1994, in the Los Angeles area. While we didn’t participate heavily in homeschool groups until I was in high school, we knew plenty of other homeschoolers and hung out with them informally. We were part of a great local group in the last two years of high school for me. If my memory serves me, pretty much everyone we knew expected both genders to attend college, even if it was considered a given that girls would probably stay home while the kids were school aged. All the girls wore pants or shorts to most activities. Families mostly ranged from 2-4 kids. Sunday School, youth groups, and AWANA (or similar groups) were considered just fine. Maranatha, Music Machine, and Psalty, with their drums and electric guitars were embraced – as were rockers Keith Green and Don Francisco. You could still have a pool party with mixed genders without everyone freaking out. In fact, once my family joined the Gothard organization, we were considered pretty out-there conservative – even though we were quite liberal for ATI. However, by the time my own kids were school aged, we found it was difficult to find a group that wasn’t dominated by Patriarchal thinking. Quiverfull, dresses only for girls, gender segregated activities, only hymns and classical, and so on. The moderator on our local non-religious non-partisan homeschool web group had to step in after Vision Forum disciples started dominating the discussion and posting articles about how no true Christian would use birth control, and similar stuff. On a group that explicitly didn’t limit itself to Christians even. There definitely has been a seismic shift within the homeschool community. I certainly hope and pray that the recent scandals will encourage people to re-think the philosophy and doctrine that has crept into our churches. Connie, I see it in the Midwest, too. I saw that the Chicago area convention is still welcoming IBLP/ATI as vendors. These people still do not get the truth that the teachings at the root of these behavior are wrong. I am going to be addressing the influence I see the patriarchs have had on what at one time were “midstream” organizations in the next part of the series. Tim, thanks for sharing that courtship/betrothal story!!! It needed to be shared! I had forgotten HSLDA once had Rushdooney testifying for them. They forgot Moore also testified for all of us, too! Ladycelt, yes, you summed that up. If you haven’t read my series of articles on the FIC, I share our own story and the struggles to find a church home that was accepting of wanting to disciple our own children. I probably have read your FIC series, but it’s been awhile. When our older kids were little, we once took them to a church with some of my relatives, where we were invited (pressured, actually) to put them into sunday school. Of course, given that worship turned out to be mega-style, loud, and resembling a Friday night concert, maybe they were better off. At the risk of rabbit trailing here as well as outing myself, our former church was functionally a FIC among other things. You may have seen that article on the Aquila Report yesterday about the PCA session that put out a statement on women serving in combat roles in the military, together with the linked statement on the bottom by the PRCC. I completely agree that young women across the board should not be subject to any future draft. I would even say that they are probably right about the particular risks to female service members in combat zones, as well as the effect on male members. The men at Trinity PCA have gone farther than this, I believe, and teach what I would expect of the patriarchy world at large–that even apart from the risk of s*xual assault, that women should not volunteer for military service at all. I’m not willing to go that far, although I agree there is a widespread crisis here. Or that if they do have support roles, they should not be required to take the oath. The problem I have with that is this could affect their eligibility for getting pensions. Then again, in patriarchy women aren’t supposed to be earning a whole lot of money. They can earn some as per Proverbs 31, but they’re supposed to be dependent on men, even as widows. I did read that article. I think there is a false dichotomy between combat and noncombat jobs for women. My husband has often pointed out that all military jobs are combat jobs and any given situation can turn into one of intense combat. This requires more consideration. Karen, I’m looking forward to reading your next installment. We homeschooled our children, but were never able to find a homeschool group that we fit in with, even years ago. Looking back, I’m sure it was because we never bought into the patriarchy thing. In fact, our initial reason for homeschooling was to give our kids a better education than the public schools offered, and our two oldest are girls who both went on to earn advanced degrees. It’s clear to me now that I gave the wrong answer when asked the inevitable “why are you homeschooling” question. I should have said something about protecting our daughters. Instead, my short version was this: for academic reasons. No wonder we never fit in. I must admit women in the military does bother me somewhat, not because I think they’re not qualified to fly an F18, for example, but more along the lines of the potential awkwardness of having men and women in very close quarters. If a bunch of guys are out on maneuvers it’s no big thing to find a handy tree or rock for . . . well, you know. It is a bit different with a girl. I still think men should treat women differently than they do other men. Chivalry is not dead and I fear our society is trying hard to kill it. Finally, knowing how corrupt the human soul is I worry about a few ladies among a whole lot of men; seems like a recipe for sexual abuse and misconduct. Granddad, I’m with you about some of the consequences of having male and female personnel together in close quarters. After some of the stories I’ve read about goings-on within all types of Navy ships, for example, there needs to be some rethinking here. Nobody today likes the idea of segregation in any form, but how many more assaults, harrassment, pregnancies leading to higher turnover among servicewomen, sexual favoritism, etc. is it going to take for anyone in the Pentagon to be willing to quit treating our military like a social laboratory? I’m not sure as to the likelihood of a future draft. My husband thinks that’s a pretty remote possibility, even with Charlie Rangel trying to introduce legislation to that effect. Some women are unquestionably cut out for military service. I believe others are not. On the other hand, if such a thing did take place, would it take formal denominational statements for individual Christian women to achieve conscientious objector status? If so, could that be done without denying the legitimacy of any women volunteering for military service? I’ve been going through the OT with my children in the morning for about the past few years. Recently we’ve been studying 2nd Samuel. My 16 year old daughter is disgusted with King David. The fact that David would not discipline his son Absalom, not protect his daughter Tamar, nor punish his son Amnon who raped the same Tamar (his sister), treated his loyal subject Joab poorly…it’s actually a long list. Yet God said David was a man after His heart. How can this be? David behaved abominably by almost any standard, yet we don’t throw out ALL of David’s reign and ministry. We correctly pick and choose. “Look up to the good, reject the bad.” This requires a lot of discernment. We can’t just accept or reject the whole of a man’s life based on his basest behaviors, else we would have no teachers or examples. This business of being a Dad, a child, a student, a discerning Christian, is not as easy at it seems. I also believe that both of these men have serious error in their doctrine, which came before their behavior and, imo, contributed to it. Doctrinal error and differences in how scriptures should be interpreted (the crux of hermeneutics) can be easily confused. Probably the best example is how Reformed/Presbyterian and Baptists differ regarding baptism (who, why, how). I disagree with the Baptist position — I think I’m right and they’re wrong — but I certainly don’t think my many close Baptist friends (which includes a pastor or two) are preaching doctrinal error. Doug Phillips and associates, on the other hand, go beyond simple disagreement and come close to questioning the commitment of any Christian who takes umbrage with their theonomic/Christain Reconstructionist approach to biblical interpretation. It’s not only their doctrine that has been questioned it’s also their arrogance and smugness. Oh, my! Some things are now starting to make so much sense. I have heard very little of this until now. I homeschooled my children from 1982 until 2001. And I never, ever thought of it as a religiously motivated activity. My husband and I were both greatly influenced by John Holt. We homeschooled because we thought it was a better academic situation for our children. I was not involved in any homeschool groups and hadn’t even met any other homeschool families in my town until the 90s when my youngest daughter was the only one still homeschooling. I met a very lovely woman, a pastor’s wife, homeschooling her kids and we struck up a friendship based on this. After a few months she told me about a homeschool group she was a part of and asked if I would be interested. I said fine and we went together to a gathering of these folks. I could see that it was a group of conservative Christian parents but that didn’t bother me. The children were off getting acquainted and playing games. But on our way home my daughter was quieter than usual and when I asked her if she wanted to become a part of this group – I believe that they met as a group every Friday – she said no. I asked her why and she told me that they had made fun of her and basically were not very welcoming. When I pressed her for details she said that they had greeted her with the questions of “where do you go to church? are you saved? how many Bible verses do you know?” After she told me this I knew that of course they were not very welcoming – she was not able to answer any of these to their satisfaction. She didn’t go to church because she went to Meeting (we are Quakers), she didn’t know what saved meant because that is not part of the vocabulary of Quakerism, and she didn’t know Bible verses because she had been taught that “…the Truth is more holy than the book…”. We never went back and my “friend” dropped all interest in me when I declined to join the homeschool group. At the time I thought my daughter and I had just run into a rather shallow group of Christians but now I wonder. Reading this is all very interesting and while I feel that of course parents have the right to decide how they will educate their children it does make me feel a little sad that the homeschooling movement, which provided so many wonderful and close times for my family, and can provide the same thing for so many diverse families who may come to it for so many reasons, may end up being stereotyped and taken over by this perception of “homeschool = patriarchal Christianity”. Former Gothardite, I cringe at remembering those things! Grandma B, thanks for your insights. I am always glad when we can be reminded that there are/were many other homeschooling families out there in there midst of the homeschooling world!